While watching the health care drama unfold for Republicans over the past few weeks and months, I kept thinking, who does this remind me of? Today it finally hit me, the Republican party, with their years of whining about Obamacare and promises to repeal and replace as soon as they were put in power, are like some of my worst students. For years they promised this, they knew that eventually it would happen and they would face a real test. But instead of studying, instead of preparing, they just kept procrastinating and accomplishing nothing helpful. Now, even their best efforts are laughable in the face of the fact that they had so much time to work something out, and can only resort of the dirtiest tricks now to try to get something, anything passed. Another Liberation Day has come and gone, and with each passing year, more and more questions emerge about the meaning of this important event and our relationship to it. 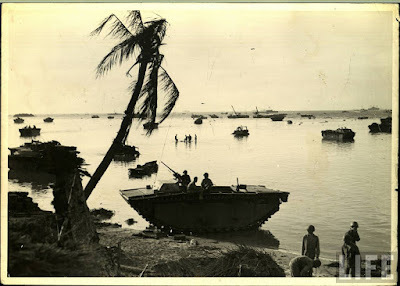 More people seem willing to question whether or not the US return to Guam in 1944 was a liberation, but for each person who earnestly asks that question, there is usually another who raises their voice in indignant defense of the liberation, demanding that it not be questioned. For them it is a sacred event for our elders and should require our patriotism and gratitude and nothing more. 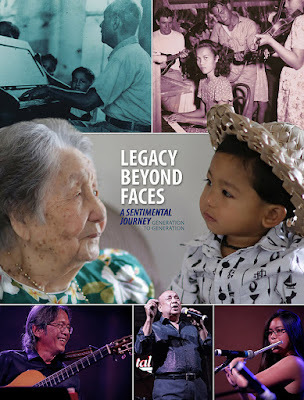 The final book in the "Real Faces" trilogy, which focuses on documenting the stories of Chamorro World War II survivors is finally here. I am happy to see it come to completion, I've been assisting with this project for several years now and it has been a very heartwarming experience. For so much of the past few decades the recounting and retelling of Guam's World War II story has been focused on the United States, their role in expelling the Japanese and ending the occupation. As a result, even when Chamorros were doing the commemorating, they were often times excluding or minimizing their own stories, their own beliefs, perceptions, and lessons, for the sake of aligning their tales and memories with a more patriotic and American-supremacist narrative. I am thankful to see that shift in recent decades, and thankful if my work, research and writing has played some role in making that happen. 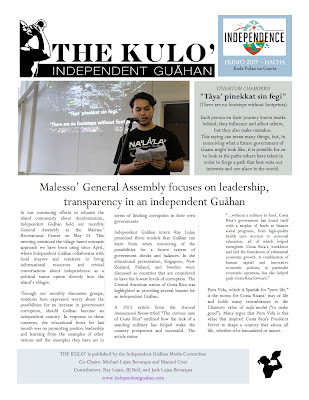 As part of Independent Guåhan's outreach to the island community around issues of decolonization, we are proud to present our new monthly newsletter titled The Kulo'. This newsletter is put together by the Media Committee of Independent Guåhan, which is chaired by myself and Manuel Cruz. Feel free to save the images and also once Independent Guåhan's official website is ready, we'll be able to archive them there for public download. People frequently ask me why I'm such a publicly critical person. They assume it is because I am half Chamorro, that I must be trying to compensate for my lack of cultural identity, and even I can acknowledge that there is some truth to that. It could be simply part of my personality, maybe I've always been an oppositional person, who challenged authority in some way. My father says it is because of the way I was forced to confront certain racial realities during my childhood. Some say it is simply because I have an artist temperament and so I am seeking creative ways out of systems, thinking about what could lie ahead on the next horizon of imagination. 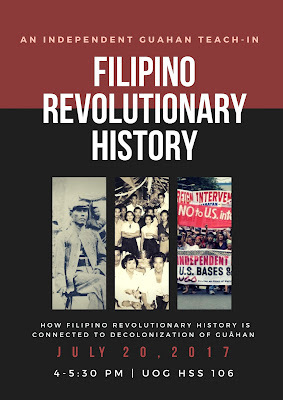 HAGATÑA, GUAM (July 11, 2017) - As part of their monthly Teach-In Sessions, Independent Guåhan will be holding a session introducing Filipino Revolutionary History and how Filipino struggles for independence are connected to CHamoru self-determination. The Teach-In will feature Josephine Ong, Kristin Oberiano, Jamela Santos and Ruzelle Almonds. “As Filipinos living on Guam, we need to acknowledge that the fight for CHamoru self-determination is a fight for the ideals of self-governance, sovereignty, and freedom - the same principles that led to the establishment of the Philippines, the USA, and other independent countries around the world,” says Oberiano, whose grandfather came to Guam during the Camp Roxas Era. Some recent updates on the health care debate in the United States. 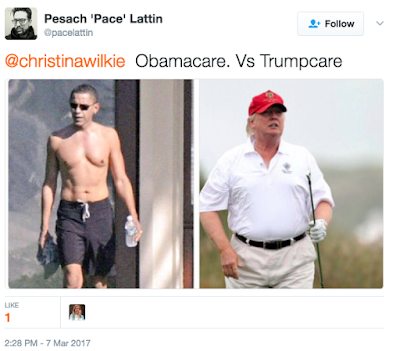 It is fascinating to contemplate that in the past few years one party lost political power in order to expand health care to tens of millions of more people, and now another party is on the verge of potentially losing power as well, by taking health care away from tens of millions as well. "Americans decided that health care is for all. Republicans want to roll that back." As vice president, I met with Americans all across our country. What they told me over and over is that the Affordable Care Act gave them peace of mind — that if they got sick, or if their child got sick, they could get care and not have to worry about going broke as a result. They no longer had to lay awake at night wondering: Can I pay for this treatment?What happens if she gets cancer?How will I feed my family and afford the care?